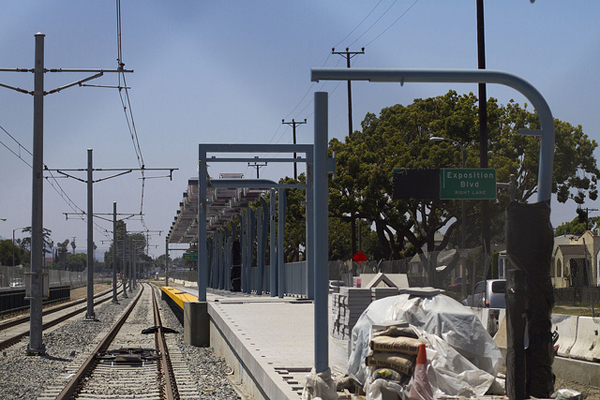 As anyone who lives or works in the area has seen in recent months, the Expo Line between downtown Los Angeles and Culver City is making some serious progress — it’s starting to look like a real rail line. 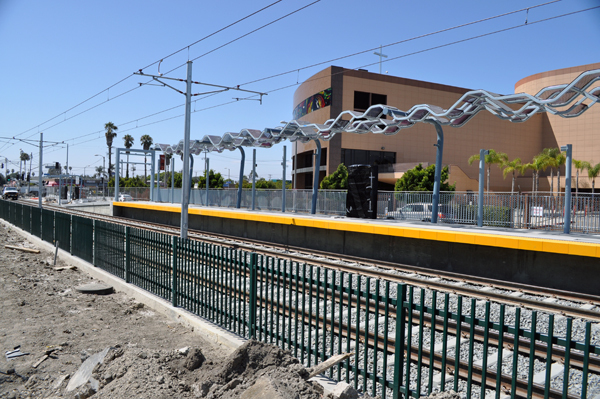 The recent state approval of a new station at Farmdale Avenue next to Dorsey High School should ensure that construction moves along at a steady clip. 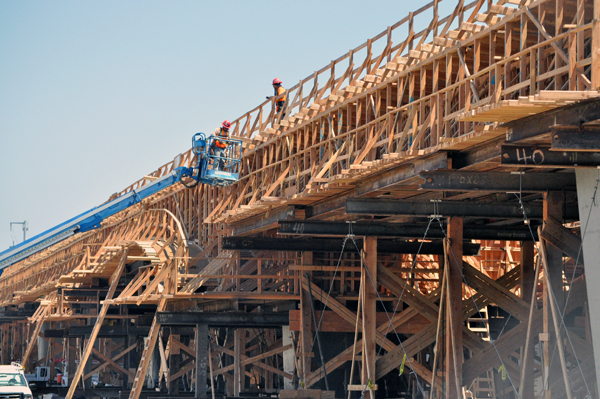 A partial opening could happen in 2011. Here are some photos below that Fred and I took this week. More photos can be seen on Metro’s Flickr page. 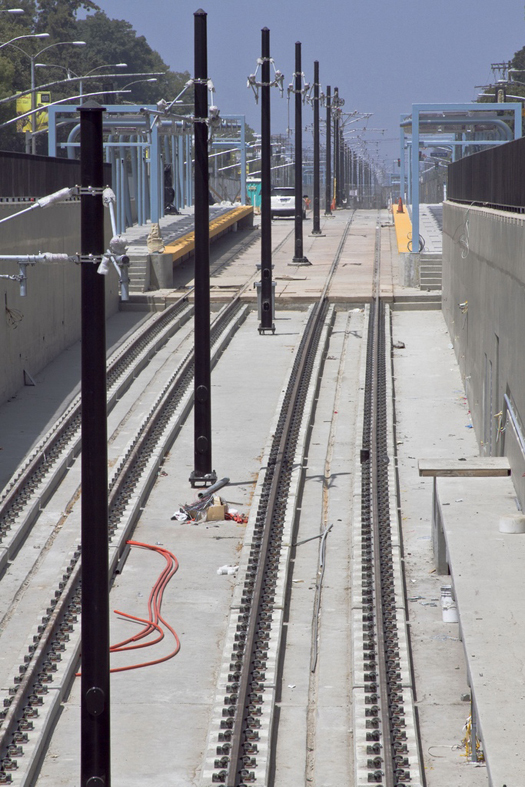 Here’s a link to an interactive map of the line on the Expo Line Construction Authority website and here is a Google satellite view to see what’s around the future rail line. The view north toward downtown L.A. from the station at Jefferson/USC. 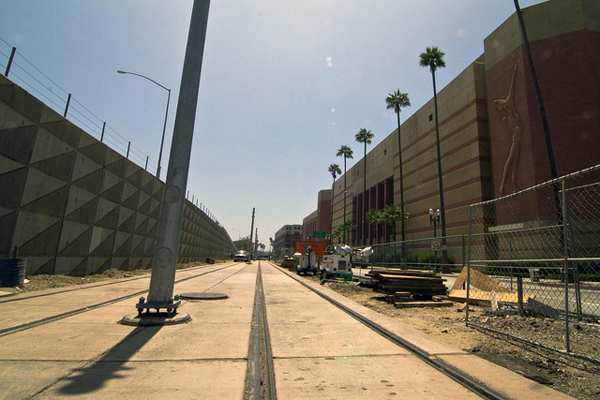 The rail line running along the east side of USC's Galen Center. The 110 freeway is on the left. 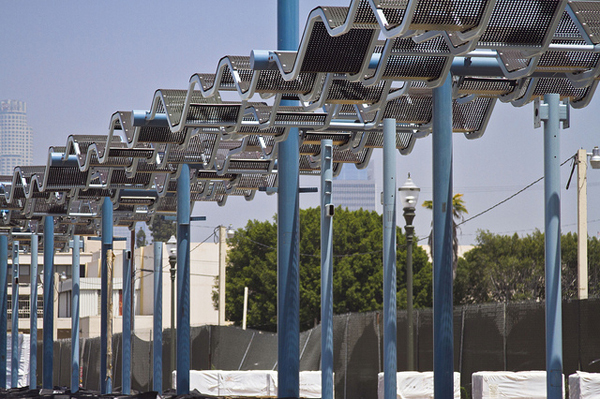 A closer look at the canopy design for Expo Line stations. 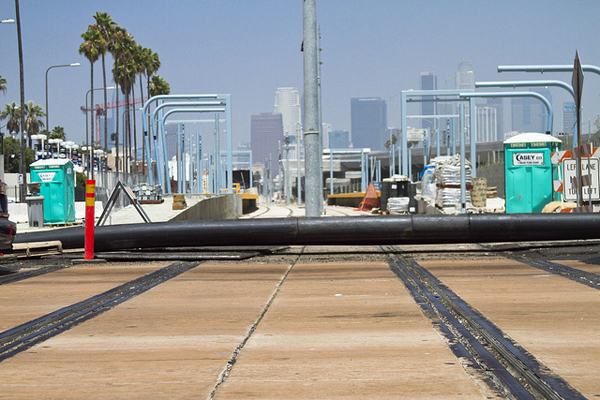 Looking west, the tracks exit the tunnel under Figueroa. 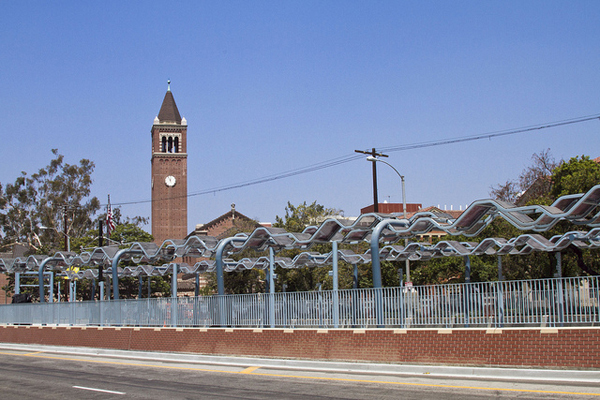 The Crenshaw station with the West Angeles Cathedral in the background. 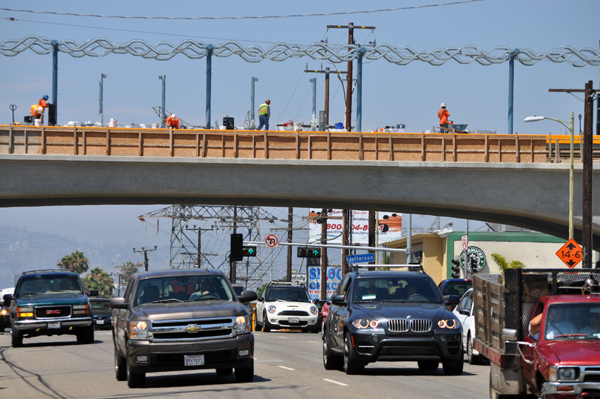 Looking north toward the station above La Cienega Boulevard. 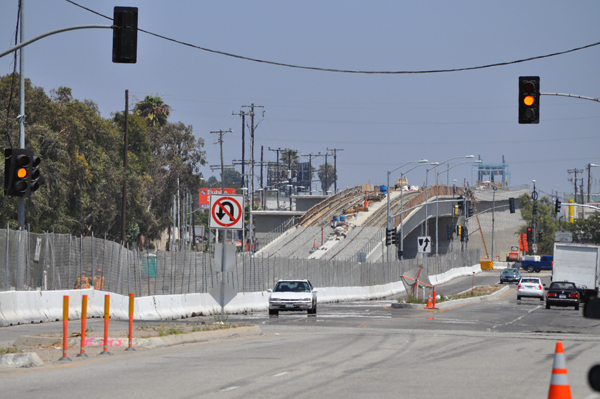 The Expo Line along National Boulevard in Culver City, looking east to the bridge over Ballona Creek. The Helms tract industrial district is on the other side of National, out of view in this photo. 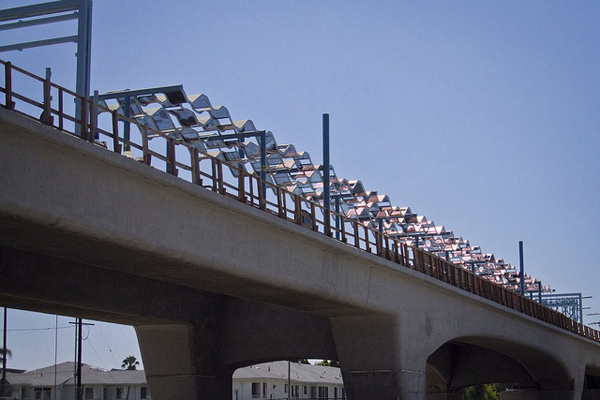 The frame of the elevated structure in Culver City. 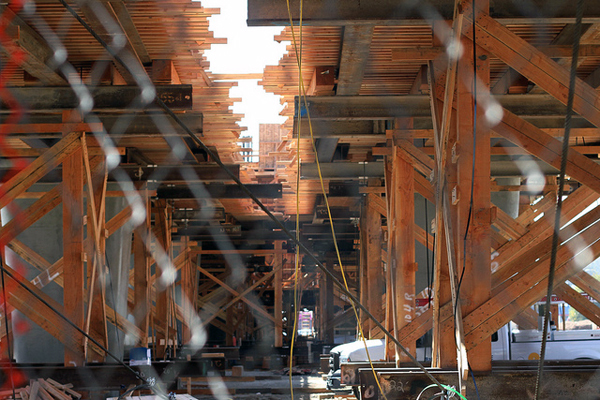 The frame of the aeria structure at Venice and Robertson, where Phase I ends and Phase II to Santa Monica begins.